Some time back, I resolved to post occasionally about things I like – but things that the rest of the world might not like so very much at all. I reasoned that it’s far too easy to post about things everybody likes (walks on windswept beaches in winter, Ben and Jerry’s chocolate fudge brownie ice-cream...). It’s also a bit ‘boring’ to post about things everybody shares a hatred for. So off I went. I started my 'likes' with Mission Impossible: 3 and that all seemed to go fairly peachy. Now, God help me, I’ve decided to put my second scheduled ‘thing-I-like’ on hold for the following very late update. I was working away last Saturday and I had on one of those TV Channels which show non-stop back-to-back old music videos. I believe they’re called ‘Back-to-Back Non-Stop Old Music Video Channels’ but do correct me if I’m wrong. Anyway on came this song. It was called ‘My Love’ and it’s by an Irish group called 'Westlife'. I admit it! I like it! I liked it when it first came out and I still like it now. So come and have a go if you reckon you’re hard enough – and if you listen to this song, you probably will reckon you are hard enough. Westlife haven’t as yet manage to ‘crack’ America but they have had a most impressive array of hit records over here and elsewhere. In fact (I looked this up) they have had 14 UK No. 1’s and they share with The Beatles the title of most consecutive number 1’s ever. If anyone in America wants to place them, their song ‘Flying without Wings’ did well for An American Idol finalist a few years ago. Now I’m not really what you might call a ‘huge’ boy-band fan. But it helps a little that most of the Westlife guys are from my hometown of Sligo and that my brother used to work on the Electricity Supply Board with the father of one of the guys . The video also shows a lot of places which I am well acquainted with. I know that train station, I know that beach, I know the cliffs too, how great are they? Most of all though I know the street near the start – I think I lived there for two years of my college time. Have a look, if you fancy it. If my friend Fragileheart comes by, she might have a little peek at the video because it's got some things she might like. It shows Ireland, it refers to coming back to Ireland and it’s got the famous Cliffs of Moher in County Clare at the end of it and, I could be wrong about this, but I think Fragileheart has been there. Most of Westlife's songs feature what I like to call a ‘stool moment’ (behave). The guys often sit on stools when doing their songs but there’s always a key moment in the tune where they rise up off their stools and give it some serious wellie. See if you can spot the ‘Stool moment’ in ‘My Love’. I bet you can. It's not all sunshine and flowers, for me, with this music video. At the start the boys have to do some acting and emoting - 'doesn't quite work guys, does it? Also, in the middle, (at 2:42) one of the guys sings a line in a heartfelt way- 'To hold you in my arms' - and, in doing so, manages to simultaneously look and sound like a complete and utter Muppet. Love them or hate them, Westlife have one thing going that lots of other boy bands haven’t. Those lads can really sing. Release this one once more guys. Go on, I think you’d do okay with it all over again. Oh, and while we’re on pop music matters. watch out for Leona Lewis covering our very own ‘Snow Patrol’ with the song ‘Run’. This is an international hit in the making if ever there was one. Mark my words… or else have a listen. I have to say, Ken, I couldn't pick Westlife out of a line up of boy bands but I've probably heard most of their singles in passing. I have nothing especially against them in the same way I had nothing against Donny Osmond or David Cassidy back in the day when you only needed one heartthrob to get the girls swooning. I watched the video (with the sound down I have to say) and I can see why it might appeal. We do the same when Taggart is on TV, look for places in Glasgow we've lived or been. Nice choices both of them, Ken. The scenery in the Westlife video quite took away from the song, though. I had to watch it twice so I could block out the one for the other. For me, Leona's choice of dress and hairstyle grated and detracted from her lovely voice. Another one that's better heard and not seen if it's the music you're after. Leona seems quite well-known in America now. Didn't Oprah give her a blessing or something. Taggart sort of lost me when Taggart died, I loved that actor - Mark McManus - he was like Alex Ferguson-turned-detective. Leona has a beautiful voice, I agree international hit in the making! "Serious Wellie". Now THERE's a name for a band. When people dismiss boy bands, I don't say anything, having grown up with the Jackson 5 and the Osmonds...what could I say after that! Good choice for the series, anyhow; I'm looking forward to another! I am on standing ovation for you on this one. They are my favorite boy band and my favorite song - you said it - "Flying Without Wings." Whenever I hear that song, it inspires and uplifts me. Do you know I have sang this in one of our parties? lol... I know all their songs and I sing with them whenever I put on their music. I have all their CDs. Incidentally my daughter who is married now, also is a big fan of Westlife. Their songs have inspiring lyrics and wonderful melodies and superb voices to go with it - The Best! Now don't tell me, I'm just being nice. Wanna sing with me and let's see who runs out of lyrics? lol..
Leona has a very powerful voice like celine dion, thanks for sharing the video. It relaxed me. It's a nice song and a nice post. Although, I prefer Westlife's cover of ABBA's I Have A Dream, which as you probably know, was a massive Top 5 Hit in Britain in 1979. Ken, this post stirs up so many things for me. Firstly, have I ever told you that I spent part of my honeymoon in Sligo? I remember how strange it felt to get off the train at the end of the line (in Canada, you have to go a long way to find that). There's a photo of me with my arm around the leg of the Yeats statue on the main drag (this was back in '94). I have also been to the Cliffs of Moher (in 1977) where my dad wanted me to walk to the edge of the cliff and look down. Being a victim of vertigo, I couldn't do that, but I DID lie down on my stomach and peer over. It was AWESOME in the true sense of the word. I admire you for your admission to liking the song (oh, and thanks btw, it'll be in my head for days now)! I feel sure that without the nostalgic bonds, you might have quite the connection to it. I can take a little what I would call "schlocky" stuff from time to time. Savage Garden comes to mind. How did you feel about the movie, "Once"? We loved it, in our house. P.S. I never peeked, but was the Bond answer "Lotte Lenya"? Jim - David Cassidy is playing at our local Arts Centre in February of next year. I've never felt the need to re-live the Partridge Family experience so, needless to say, I won't be buying tickets. Pro: I love any group that can actually sing harmony, which made the tune stick in my head, if not the words. Harmony seems to be a dying art. Con: Although very pleasant, they sound like every boy band I've ever heard in America. Not a bad thing. Just a predictable one I guess. Interesting though, that no matter where some is from, 95% sing without an accent. As for Leona, she was deemed by Simon Cowell as the next IT girl. [Have the British banned him from their country? I'd like to give him back.] She's pleasant enough... sounds like Mariah Carey to me. One of the Westlife boys used to babysit my cousin, if that's interesting at all. They certainly seem to get around the Sligo population. I don't even know if they can sing. I know that the AutoTune can. But maybe I'm being cynical. Leona wouldn't load for me, so I can't pass judgment on that, but I do love some good manufactured pop now and then. Girls Aloud especially. Occasionally some Sugababes. We all have our dodgy pop weaknesses (though I couldn't get through that Westlife clip...bland...bland? At least the Osmonds wore amazing outfits...did a bit of dancing...and come on...'Crazy Horses'..!). But I suppose we can let you off if they have shared local history. Or something. Although saying that I have a friend who loves that Snow Patrol song and I'm sure if I want to really upset her I could play that LL version ('no, love...look like you really mean it...'). I watched X Factor once...just once...and that was enough. And I HATE Simon Cowell. My friend once made me a T-shirt and a fridge magnet with a picture of the boys and the caption 'Westlife ROCK'. However, in small print between those two words was 'should be tied to a large', and after the 'ROCK', also in small print was 'thrown into the sea'. Wonder if she'd seen this video too? May I ask this question? I'm curious, has anyone ever fallen from those cliffs? They're so scary. Ken and Jena Isle in a Westlife duet - poor Leona would not stand a bloody chance! Hi Kat, last thing first - it was Lotte, yes, well done! Smart cookie. I'm actually typing this from Sligo (just here for the day) and I will doubtless stroll past WB Yeats' statue shortly - I will give him a surripticious stroke on the thigh for you. Gotta go - out of credit, more later. Brav e you are, my friend, brave indeed. I admire that! Yeah, I'm not into boy bands either. Or pop music. But I did fancy that Westlife video, Ken. Definitely made me smile. And you have a Smile awaiting you over at She Lives. No, no, no, no, no....I prefer Westlife's I Have a Dream to Westlife's My Love....no cover can touch an ABBA original...especially a FRIDA original. Let's be clear, now! Leona wouldn't load for me either... let's not go there. Dave: I'm not that brave, but it's an interesting exercise to pick things I like which are largely indefensible - all part of the search for Truth. Matt: Ha! I knew that. Ken, A surreptitious stroke on Yeats's thigh, can only improve my craft. Ha ha. Ken, no need to post this comment - just want to say, I'll get round to reading your play this week and you missed my suggestion on your lyrics in the post below (and I'm serious)! So...what do ABBA and Celine Dion have in common? What?! Not more of you out there like this band's music? I must be in the minoriy on this one. I sincerely like Westlife's song. I thought they harmonized very well. They have that smooth, romantic voices, singing a romantic song, which was shot in a romantic setting. What else could anyone ask for? The young lads are all very handsome, too. Good for the young lasses to look at, you see? I think the band will make it very big in America if given the chance. I happen to like some boybands' music. Infact, I have many of InSync's and Backstreet Boys' songs in my ipod. I'm not shy to admit. I suppose, only the true romantics can appreciate this kind of music? LOL. And Leona, I have to give it to her. She has the lungs and the voice to reach those high notes. I only wish the beginning of her song wasn't too soft and too slow. Hi Kat: No, I got that message and I'm working on it! :) I gave WB Yeats a stroke for you - he 'cast a cold eye' on me as I passed by. Hello dear Ken, I'm so sorry I've been MIA. I've been easing back into things and finally made my way over here. 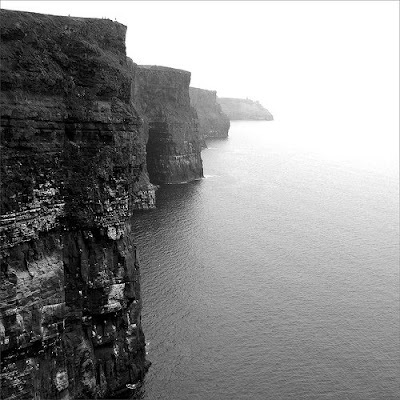 I have indeed been to the Cliffs of Moher - twice in fact :) I love that place. p.s. Leona Lewis needs to stay away from Snow Patrol's songs. They do a MUCH better job.